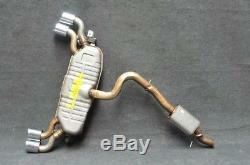 Audi tts tt s 8 coupe cabriolet muffler exhaust system 8s0253611. This product page has been automatically translated. If you have any questions, do not hesitate to contact us. Audi tts coupe / cabrio 8s. The exhaust system without servo motors! Part number: 8 s 0 253 825 un / 8 s 0 253 411 un / 8 s 0 253 611 e. Condition: good, silent & inserted hose, see figure 2-3. Many more audi parts, contact us! The item "audi tts tt s 8 coupe cabriolet muffler exhaust system 8s0253611" is on sale since Wednesday, May 16, 2018. It is in the category "auto, motorcycle parts, accessories \ auto \ spare parts \ exhaust systems "complete exhaust systems".Onlinehandel" and is located in / in diepholz. This item can be shipped to the following country: european union.